Nevertheless, hospital chains continue to invest, in the hope that better scale will translate to profits in future. FHL has been an aggressive entrant, growing through acquisitions and management tie-ups with existing hospitals. But its new acquisition of some hospitals from Wockhardt Hospitals Ltd is its most ambitious. It will pay Rs719 crore to buy eight running hospitals and Rs190 crore towards the cost of two under-construction hospitals. The running hospitals are estimated to have a turnover of around Rs310 crore, which translates to a price/sales ratio of about 2.3 times. That seems fair considering Fortis itself trades at a historical price/sales ratio of 4.2 times. But the valuation also depends on the profitability of these hospitals, which has not been disclosed. The acquisition will be funded through Rs250 crore of debt and the remaining Rs659 crore from shareholders’ funds. FHL plans to raise Rs1,000 crore and will use the remaining cash to lower debt. Ironically, Wockhardt Hospitals had planned a public issue nearly a year ago, which failed. If it had not, it would have perhaps been on the prowl for more hospitals, rather than shedding its prized assets. 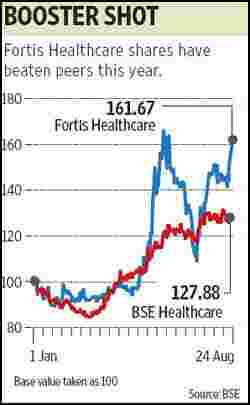 Integrating an established and sizeable hospital network will be a tough challenge for Fortis as will managing its debt burden. Interest and depreciation are the two main causes of profit erosion. Its share price closed at Rs116 on Monday, after touching a high of Rs121 on BSE. That could be a reflection of either the challenge that lies ahead or the fact the price has already run up 14% in a week’s time.